Ornua Foods is responsible for the global marketing and sales of Ornua’s consumer brands including Kerrygold, Dubliner, Pilgrims Choice, Forto, Avantage and BEO. Markets are served by production facilities and in-market sales and marketing teams in Africa, Asia, Germany, Ireland, the UK, the rest of Europe, the Middle East and the US. At Kerrygold we are committed to delivering high quality, nutritious dairy products from the milk of grass-fed cows. Ireland’s grass is rich in beta-carotene and gives our product range of butter, cheese, yogurt and milk powders their distinctive taste and texture. Pilgrims Choice is on a mission to fill life with flavour. We’re anti-bland and pro-punchy, it is how we think, act and how our game changing cheddar will always taste. All our cheese is hand selected for extra flavour as we are the choice for cheese lovers, that deserve mind-blowing, explosive and addictive flavour in every bite. The flavour of Pilgrims Choice is so powerful it can even fill your dreams with flavour, It’s the cheese of your dreams. Beo Milk is a delicious and nutritious drink suitable for all the family. Produced from natural, fresh skimmed cow’s milk and vegetable fat, Beo Milk is specially formulated with Beo Vits, which are essential for brain development, energy release and overall good health. 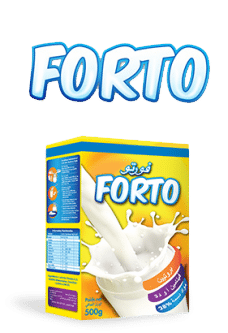 Forto is popular with mothers of children aged 3+ years-old, who seek a reliable product with consistent quality that delivers value for money. Forto comes in both full cream and fat filled milk powders.